Lovely sound therapy for cancer. This is where I may lose some of you – but I don’t mind. Since the outset of this diagnosis we have used two elements together – Tibetan Singing Bowls and Visualization. My belief in visualization is unshakeable, and here’s why. More than 30 years ago my mother and my mother’s sister, my aunt, where both diagnosed within weeks of each other with breast cancer. My family, my mother, was very poor, and the medical assistance that she received was what the system here in Canada allowed for. Saying that, I feel our medical system is pretty good. However, my aunt, was very wealthy. She was able to access the best specialists and explore opportunities not open to my mother. They both had surgery – my mother had a mastectomy and lymphectomy – my aunt had a double mastectomy (although I believe the cancer was only in one breast) and lymphectomy. My mother survived, my aunt died. My mother for the balance of her days (which was another 25 years) told us the difference was that she imagined Roman gladiators going through the chemo line battling and slaying all the cancerous cells, something she said that my aunt considered too fanciful. My husband is a music teacher and believes in the difference music can make. For years we have had various books lying around the house about music therapy – he’s always believed that we have a tone and harmony unique to each of us. When he was diagnosed with cancer we lost a few days to shock. Once we got back up and running we started to use the Tibetan bowls directly on his chest. The main bowl that I use is a G – Throat Chakra. When I place the bowl on his chest and use the mallet on the rim the vibrations and sound are quite soothing. He seems to find a great deal of relief and sleep comes quite quickly. While I am using the bowl I try to engage his imagination by creating a scene for him. I say things such as “feel the vibrations fill your lungs. Your right lung is full, now your left lung. The vibrations create a bright light in your lungs and create harmony and balance for your healthy cells. Use your mind to find the cells that don’t belong and see them die.” Something along these lines. We do this each night at bedtime so that he has the opportunity to engage his imagination and visualize the cancer leaving his body through the night. He heads into his night time sleep very relaxed. 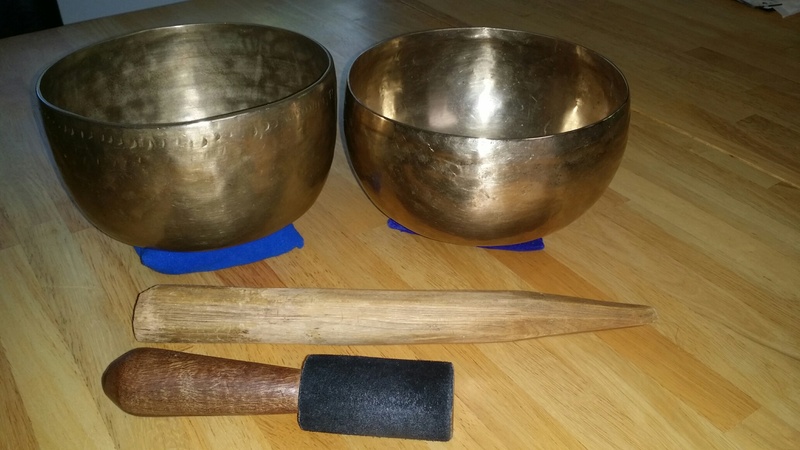 There is lots of information on all of the above, on Tibetan singing bowls as an alternate therapy, on sound therapy, on visualization. In our case this is something that we believe in and that poses little risk if any. Meditation, visualization, de-stressing, relaxing all help to allow the body to focus its energy on the real battle against cancer.